I recently came across at ski industry survey and there was a question, I can’t remember the question verbatim, but it was something along the lines of, “are there any sports or activities that you don’t support”. Predictably, hunting was at the top of the list by a large margin. This is an opinion I come across often and, as a hunter, I feel that it’s my job to defend, or at least explain my feelings on the issue. Usually, if I explain my thought process and the actual process of putting meat in my freezer (in addition to the fact that I don’t eat meat that I or a friend didn’t kill), even people who take a strong anti hunting stance are generally supportive or at least understanding. Of course, this isn’t universally true, and I can respect an anti-hunting viewpoint as long as it isn’t out of ignorance or misunderstanding. So, in an attempt to educate and explain (and maybe inspire), and because it’s something I love writing about, I decided to start this series. 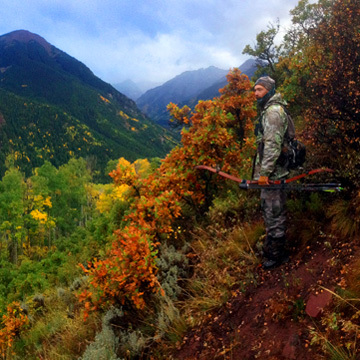 Traditional archery hunting for elk is one of my passions. It’s one of the hardest things I’ve ever endeavored to be good at and it has been a long journey to get to where I am now. It’s been a labor of love and one of the most fulfilling things I’ve ever done. It connects me to the universe in real and visceral ways. It’s given me a deep understanding of our dependance on our environment. It puts delicious, free range, organic, ethical meat in my freezer all year round. It gives me meaningful gifts to give to friends without spending my money to support things I don’t believe in. Mostly, it gives me an amazing opportunity to adventure and explore the most beautiful places on earth in the most present and connected way that I can imagine. Non-hunters generally have a preconceived notion of what hunting is that vastly differs from what my experience has been. My experience has been one of respect and reverence for the animals, extremely hard work, and a heightened appreciation for the true cost of meat. I will delve into the ethics of killing eating animals as well as what goes into finding, stalking, calling, and getting within 20 yards of the biggest creature in the high forests of the Rocky Mountains. This series will explore my journey to becoming a hunter as an adult, how I learned the incredibly involved process, and the epiphanies and moments along the way. Betraying the core beliefs of those that brought you into the world is not an easy task. We’ve all heard stories about the soul-wrenching challenges that face the Bible belt child morphed into an atheist adult. This may have been worse. In my household there was little distinction between the NRA and the KKK. Hunters were rednecks and guns did in-fact kill people. The voices of Ira Glass and Teri Gross mixed with the Beatles and Neil Young filled my childhood. My father, a physician, is an atheist empiricist and my mother, a former art teacher and owner of a children’s bookstore, describes herself as a secular humanist. Both were disgusted by the idea of shooting an animal for food, fun, or otherwise. I don’t know the original genesis of the idea but I believe it was a cumulative process. Years of my friend’s stories and Hemmingway writing mixed with Upton Sinclair, Michael Pollan, and Food Inc. I wanted to feel a deeper connection to the food I was eating, I didn’t support the meat industry, and I loved the idea of any excuse to spend more time outdoors. It was a process that ebbed and flowed for years before it came to any kind of fruition. The idea suffered its first real setback when I first began exploring the idea out loud and mentioned to a friend of a friend, who has since been dubbed “Racist Karl”, that I thought I might buy a gun. The response, “I think it’s a good idea. We should all arm up… We’re at war and we’re about to have a black Muslim president,” made me rethink the notion in a serious way. As my visceral response to Karl’s comment faded I spent a year or two annoying my hunter friends with questions about licenses, laws, techniques, and the emotions associated with pulling the trigger or cutting open a huge beautiful animal. Mostly, I was regaled with stories of serene camp sites in the high alpine of Aspen, Colorado and heroics of taking down a charging elk with a fourth arrow. At that point, I didn’t have a philosophy or a decision, just a curiosity and the vague idea that it was something I wanted to pursue.